Celebrities, scientists and advocates have joined forces to write to lawmakers over controversial proposals that could see thousands of captive wild horses sold for slaughter. 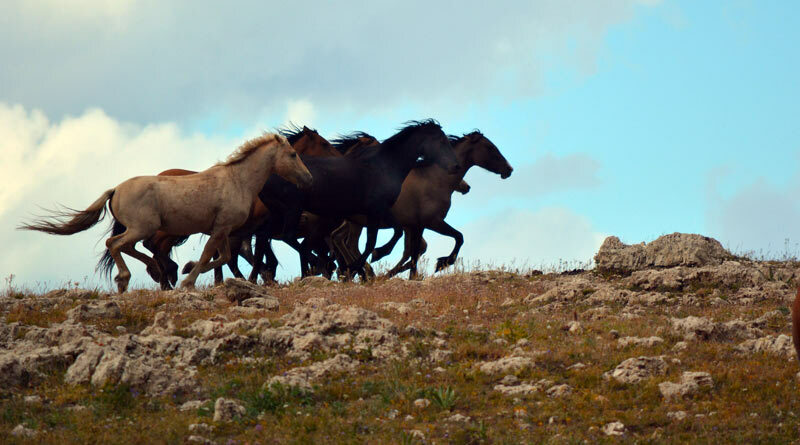 The Bureau of Land Management has attempted to control rangeland numbers of wild horses through regular musters, with the horses kept in captivity under long-term grazing arrangements. There are now close to 40,000 horses being held in such facilities, placing a growing strain on the bureau’s budget. The agency is now seeking permission from lawmakers to sell the horses without limitation, meaning buyers will no longer be required to provide assurances that the animals will be kept out of the slaughter pipeline. Without such a provision, wild horse advocates fear that the horses will be sold for slaughter in plants in Mexico and Canada. On July 18, the House Committee on Appropriations will vote on the 2018 Interior Appropriations bill. The bill, approved by the House Interior, Environment and Related Agencies Appropriations Subcommittee, maintains protective language for horses, but there is a chance it might be amended in full committee and removed, creating a pathway to slaughter. Now, more than 50 actors, singers, screenwriters and scientists have joined the Humane Society of the United States, the Humane Society Legislative Fund, Return to Freedom and the ASPCA to draw attention to the threat posed to wild horses and burros by the proposal. “My family and I stand strongly against horse slaughter and against our government harming our wild horses,” said actor and director Ed Harris. A number of advocacy groups, including the HSUS, have long called for the agency to cease the musters and instead redirect money toward fertility control measures on the range. Advocacy groups believe tens of thousands of horses will die if Congress approves provisions in the president’s budget. “Our nation’s iconic wild horses are fighting for their lives and we cannot stand by silently and let that happen. “We the undersigned call on Congress to oppose provisions in the president’s 2018 budget that threatens the lives of tens of thousands of wild horses and burros that will be senselessly killed or easily sold to those who would profit from their slaughter. “Two years after the passage of the ‘Wild Horse Annie Act,’ which banned the use of vehicles to hunt down wild horses sold for slaughter, the 1961 movie The Misfits brought the brutal practices of the mustangers onto the big screen. Marilyn Monroe cried out on behalf of audiences when she pleaded for a roped and struggling wild horse to be set free. A scene from The Misfits. © Metro-Goldwyn-Mayer Studios Inc.
That you to everyone involved with saving our wild horses. Can you please tell me who organized this? I’d like to team up with others fighting to save our wild horses. Thank you. I thk everyone for being their voices. I pray that this ends very soon. The unnecessary brutal attacks are deff not for the good of our horses & I do not accept that my tax dollars are being used in this destruction of life.